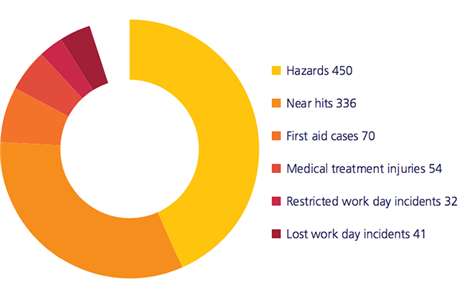 EUROPE: The annual health and safety incident report by the G9 offshore group shows the total recordable injury rate (TRIR) on offshore projects has fallen 3% compared to 2014. The report, covering 2015, recorded a rate of 5.99%, compared to 6.22% last year. According to G9, 45 offshore projects recorded data for the report, up from 43 in 2014. TRIR is measured by the number of recordable injuries per one million hours worked. Over 21.22 million hours were worked on offshore projects in 2015, 11% down on 2014. Once again, there were zero fatalities reported in the offshore industry. There was also a 7% fall in lost work days and a 39% drop in injuries requiring medical treatment. However, there was a significant increase in restricted work days due to incidents, the report found. In 2014 there were 14 restricted work days, which more than doubled to 32, the report said. A restricted work day is defined as: "[An] incident that does not result in a fatality or a lost work day but does result in a person being unfit for the full performance of the regular job on any work on any day after the occurrence of the occupational injury. G9 was set up in 2010 by nine offshore wind project developers, including Danish firm Dong Energy, UK-based Centrica and Sweden's Vattenfall. It aims to improve health and safety in the offshore industry. You can access the report here.